More than 200 people gathered outside on the UNC campus Wednesday night, less than a mile from the spot where Feng Liu was robbed and beaten last week. The vast majority in attendance were part of the Chinese-American community and UNC’s Pharmacy Department, where Liu was a professor. The evening began with remembrances from friends and colleagues. UNC Chancellor Carol Folt offered condolences to those who knew Liu best. “I have heard so much about him; A brilliant scientist, a dear and wonderful person,” Folt said. The Chancellor also tried to reassure members of the UNC community in attendance that she and the school consider public safety a priority. An alter at the front of the crowd featured a large photo of Dr. Liu in his lab coat, smiling. He was well known for his infectious smile. UNC Dean of Pharmacy Bob Blouin said if you went into a meeting with Liu, you always came out better than before. "His true impact will far transcend the science and the papers that he published," Blouin told the crowd. "It will transcend in the people that he helped to train. The people he touched in his life." 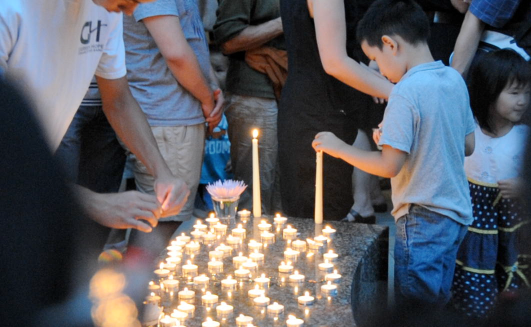 After a candlelight vigil, and a traditional Chinese honor of bowing three times to Liu's photograph, the crowd walked to the scene of what police have deemed a homicide. It was there that two men are alleged to have beaten Liu with a decorative stone, and taken his belongings while he was on a walk during his lunch break at 1:00 in the afternoon. Derick Davis and Troy Arrington, Jr. are being held at the Orange County Jail, awaiting trial on first degree murder charges. Liu leaves behind a wife and a daughter, who is carrying his first grandchild. The University of North Carolina is planning a memorial service for Liu this Saturday at 4 p.m. at Memorial Hall, on campus.